With over a decade of experience in the field, you can rest assured our technicians have the right knowledge and equipment to provide competent and affordable spring repairs, carried out in a quick, safe, and efficient manner. We have over ten years of field experience and know what it takes to perform a job well done. You should never compromise your safety by attempting a DIY repair on your own. Instead, hiring our professionals for a range of garage door repair services, including the repair, adjustment, and installation of torsion and extension springs will bring the safest and most efficient results. Our skilled technicians will carefully unwind the broken garage door springs in order to release the tension before disassembling the entire system and installing the new springs. After putting everything back into place, our professionals will tighten and lubricate the springs to ensure maximum safety and test the mechanism for adequate operation. We specialize in servicing all types of garage door springs, including the two most commonly used kinds - torsion springs and extension springs. 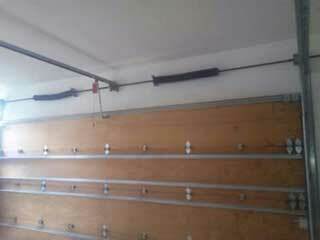 You will find your torsion springs located directly above your closed garage door while the extensions springs sit above the upper tracks on each side of your garage door. Our repairmen will be there to service your springs the right way. Rest assured we will get your door back in order on the first attempt and at a fair, reasonable price. We stock a wide variety of spare parts in our service van so that our technicians always have the necessary replacement parts at hand. Even in an unlikely case where we do not have the right springs for your door, we will clamp your broken spring and put a special order in for your specific needs. This temporary solution will allow you to use your door as usual until your new springs arrive and are installed by our professionals.